PROPERTY developer Glomac Bhd is organising an event to showcase its properties, which will end on April 30. Dubbed “Glomac 360° Showcase”, it will showcase the company’s various properties, including its township developments in Selangor, Bandar Saujana Utama and Saujana Rawang, as well as Sri Saujana in Johor. Glomac said in a statement that during the showcase, each development will provide promotional benefits, such as up to 100 per cent loan, zero-per cent interest during construction and savings of up to RM100,000. SELANGOR Properties Bhd said its first quarter net profit plunged by 96 per cent due to a foreign exchange loss, the fall in value of investments and the lack of an exceptional gain. It made a profit of RM23.6 million for the first quarter to January 31 2008 from the sale of Wisma Damansara. Its net profit for the quarter to January 31 2009 fell to RM1.75 million from RM43.16 million previously. Revenue for the period under review was RM41.73 million compared with RM40.99 million in the previous corresponding period. Magna Prima plans to build commercial and residential properties worth RM1.3 billion on the land on which the Lai Meng Primary School and Lai Meng Kindergarten sits. Magna Prima Bhd appears to have struck gold as it is buying a piece of prime land in Jalan Ampang, Kuala Lumpur, a stone's throw from the Petronas Twin Towers. It will spend RM148.2 million to buy the land on which the 44-year-old Lai Meng Primary School and Lai Meng Kindergarten currently sits. In its place, the company plans to build commercial and residential properties worth some RM1.3 billion, Magna Prima told Bursa Malaysia in a statement. This would probably be the third time that a school in the city centre is giving way for redevelopment. In 2000, the Bukit Bintang Girls School was moved to make way for the Pavilion Kuala Lumpur, a shopping mall. Eastern & Oriental Bhd and the Lion Group relocated St. Mary's School in Jalan Tengah/Jalan P. Ramlee to Selayang and work on the new project has started. "The proposed acquisition also creates an opportunity for the group to venture into the high-end property market, seeing that land within the KLCC area available for development is scarce," Magna Prima said in its statement. Magna Prima will buy the existing land of 10,587.5 sq m from the Lai Meng Girls School Association. The purchase price, which is a quarter less than its market value, will be paid in cash and funded with internal funds, bank loans or through a joint venture with partners. As part of the deal, Magna Prima will give another piece of land double the size of the existing property for the relocation of Lai Meng. The new land is in Bukit Jalil. Magna Prima will design, arrange and organise the construction of the new school. However, it is unclear which party will bear the construction cost. 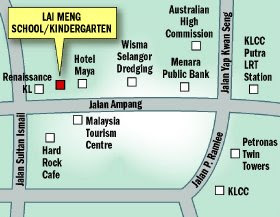 Its project in Jalan Ampang will only start when the new school is completed. The development has an estimated gross floor area of 1.2 million sq ft and an estimated gross development value of up to RM1.3 billion. The project, due to start in 2012, is scheduled for completion in 2015. Shares of Magna Prima were not traded yesterday. The counter's last closing price was RM2.10. 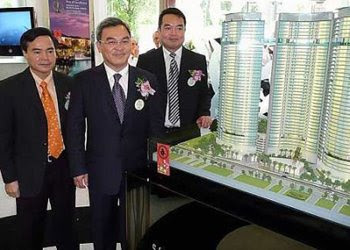 KUALA LUMPUR: Magna Prima Bhd’s wholly-owned subsidiary, Twinicon (M) Sdn Bhd has entered into an agreement with the Lai Meng Girls’ School Association for the proposed acquisition of land for RM148.151mil. The proposed acquisition involved a total of 10,587.5 sq m, the company said in its filing with Bursa Malaysia. The proposed acquisition was expected to be completed by 2015, it added. SINGAPORE: Singapore, expected to be emerging Asia's worst hit economy this year, plans to spend between S$18 billion and S$20 billion (S$1 = RM2.41) on infrastructure projects in 2009, a government minister said yesterday. In 2010 and 2011, the government would continue to invest another S$15 to S$17 billion each year in building and infrastructure projects, Grace Fu Hai Yien, Senior Minister of state for National Development, told a seminar on Asia infrastructure. 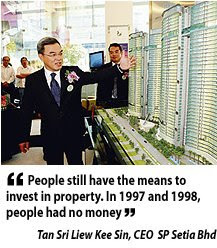 Fu said the 2009 spending included construction of a new cruise liner terminal, new roads and parks, and the upgrading of schools, sports facilities and public housing estates. "Here in Singapore, we are taking the opportunity of this downturn to build our own 'highways' to prepare for the next phase of Asia-centric growth. And upgrading of our infrastructure is a key part of this growth strategy," Fu said. "Our financial resources allow us to undertake the projects at the appropriate time despite the negative economic outlook." Fu did not say how these projects would be funded. In January Singapore for the first time tapped government reserves to pay for part of a S$20.5 billion budget stimulus package, which included S$4.4 billion on infrastructure, education and health, as well as other measures to help firms. Singapore's economy could shrink by 4.9 per cent this year, its worst year ever, hit by a downturn in trade, a Reuters poll of economists showed earlier this month. Some economists have since revised estimates downwards, with Goldman Sachs expecting an 8 per cent contraction. Lee Kuan Yew, Singapore's most powerful politician, was quoted as saying on Friday its export-dependent economy would take at least three years to recover from the recession.